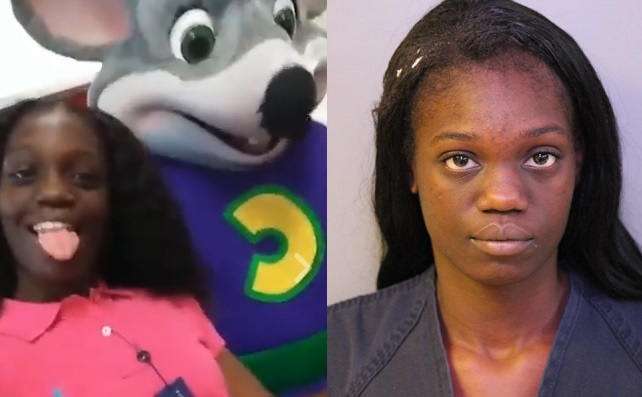 LAKELAND, Florida - A wanted Florida woman was arrested Monday after Polk County Sheriff's detectives were alerted to a Facebook Live video being recorded by her at a Chuck E. Cheese's in Lakeland, Florida. The sheriff's office then contacted Lakeland police who arrested 18-year-old Markesha Wilkerson for violation of probation and failure to appear on original juvenile charges of improper exhibition of a firearm or dangerous weapon and attempted battery. Wilkerson was booked into the Polk County Jail on a no bond status. According to the Polk County Sheriff's Office, Wilkerson has fourteen previous charges, at least six of which are violent (battery, domestic violence battery, and aggravated assault). Of the 14 previous charges, one was a felony aggravated assault, six were misdemeanor charges, five “other/unknown” charges, such as probation violation, and two failures to appear in court. “If you are a wanted person with outstanding warrants or pick-up orders, it’s probably not a good idea to go on Facebook Live,” said Polk County Sheriff Grady Judd.